Are you confused by the bright lines on your trader friend’s price charts? What value do those squiggly lines add to your chart analysis? In technical analysis, these colourful lines are technical indicators used for forecasting the market. There are tonnes of trading indicators with creative traders churning out new variants every day. There is absolutely no need to master them all. But you should know the ten technical indicators that follow. For each trading indicator, I will briefly explain its calculation logic. We aim to find out what goes into each indicator while avoiding their intimidating formulae. I will also describe each indicator’s basic usage together with an example chart and further resources. A moving average is one of the simplest technical indicator derived from price. Although there are many versions out there, there are only two common variants. The simple moving average was popular in the past as it was easy to calculate manually without the need for computers. Now, despite powerful charting platforms, it continues to attract traders with its sheer simplicity. The SMA is calculated by taking the average closing price of the past N bars. The trader provides the input N.
The basic approach is to compare the price with the SMA to assess the market sentiment. You can also look at the slope of the SMA. As we overlay moving averages on price charts, it is also possible to use them as support/resistance levels. 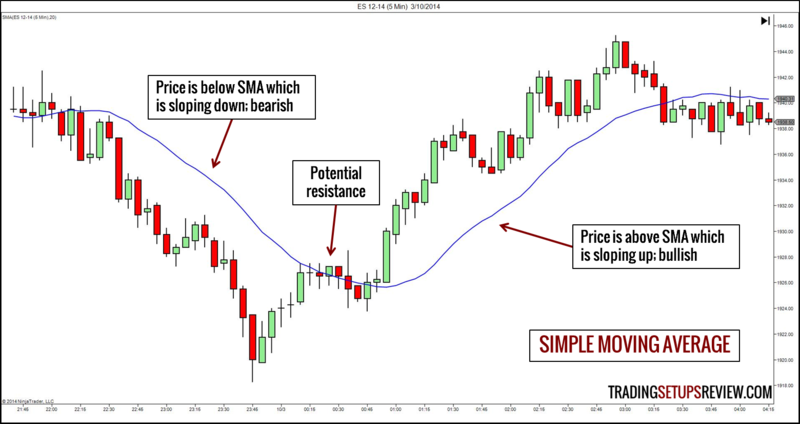 Find out how to trade with only a 20-period moving average. In the past, the SMA was just MA. But traders grew dissatisfied with the SMA as they always do with simple methods. So, they started to tinker with it. They then had to call it “simple” to distinguish it from its complex counterparts that resulted from the tinkering. One of the SMA’s sophisticated cousin is the EMA. Like the SMA, the EMA is also an average closing price of the past N bars. However, it is not a simple average. It is a weighted average. In obtaining the EMA value, we give a higher weight to the more recent values. The result is a moving average that is more responsive to current prices. 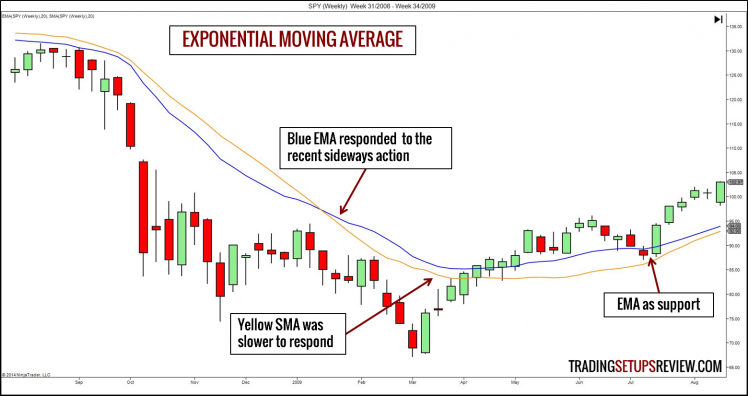 The interpretation of the EMA in trading is the same as that of the SMA as stated above. The key here is to recognise the trade-offs between the SMA and EMA. As the EMA is more responsive to recent market prices, it produces more signals from bullish to bearish and vice versa. However, the more signals a moving average provides, the less reliable each signal becomes. This trade-off is inevitable among technical indicators. The 9/30 trading setup uses a 9-period EMA with a 30-period WMA. Find out more about the difference between SMA and EMA. 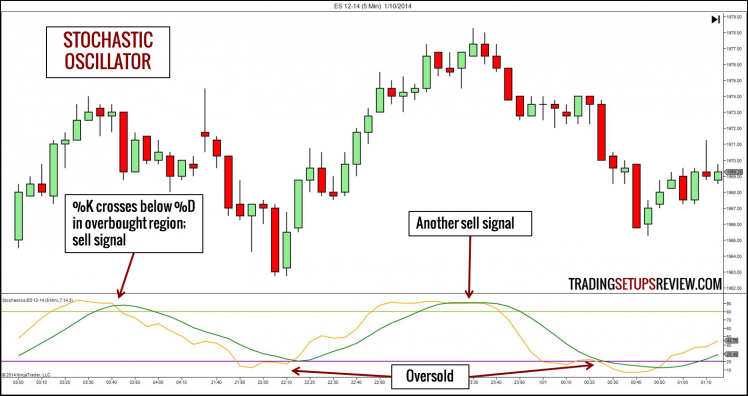 Trading oscillators measure the momentum/speed of price movement. Mostly, they find over-extended market movements that might be reversing. Let’s take a look at three common oscillators in technical analysis. George Lane’s Stochastic Oscillator had been the classic oscillator since its invention decades ago. For a fascinating history of the Stochastic, take a look at this article in MTA’s knowledge base. The Stochastic plots with two values: %K and %D. As an example, consider the price range of the past two weeks. If the price is near the top of this range, the two-week Stochastic produces a high %K value. If price hovers near the bottom of the range, it gives a low %K value. The %D line, which is usually a 3-period moving average of %K, acts as the trigger line. A few tweaks in its formula ensure that the Stochastic values always fluctuate between 0 and 100. If the market is at the extreme (high or low) of the recent trading price range, there is clearly strong momentum in one direction. But the momentum might be unsustainable. Hence, there are overbought and oversold zones. Combining both the %K and %D lines offers exact signals. A multiple time-frame day trading strategy that uses Stochastic. How to really calculate the Stochastic (with Excel spreadsheet). There is one person we can never avoid when we talk about technical indicators. He is J. Welles Wilder. The RSI is one tool in his diverse and valuable toolbox. 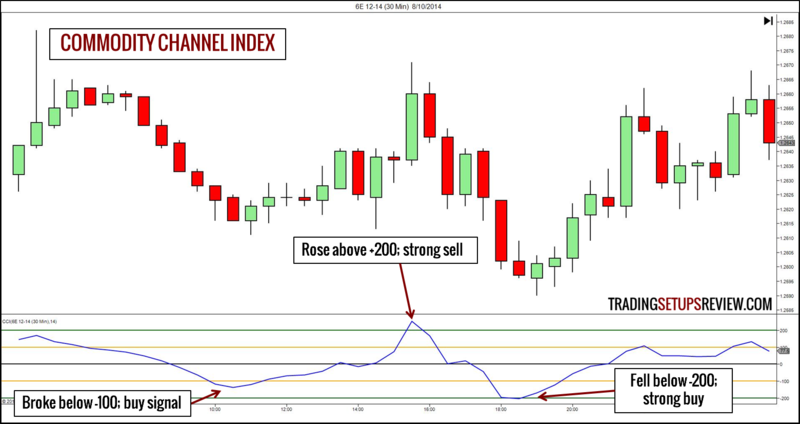 The RSI measures the speed of price movement using concepts of average gain and average loss. The RSI combines the average gain and average loss into a single ratio (RS) that represents price momentum. Then, we apply a smoothing process similar to that of the EMA. Like the Stochastic, the RSI values are always between 0 and 100. If the average gain outpaces the average loss consistently, the market might be poised to fall. The reverse is true when the average loss is leading. 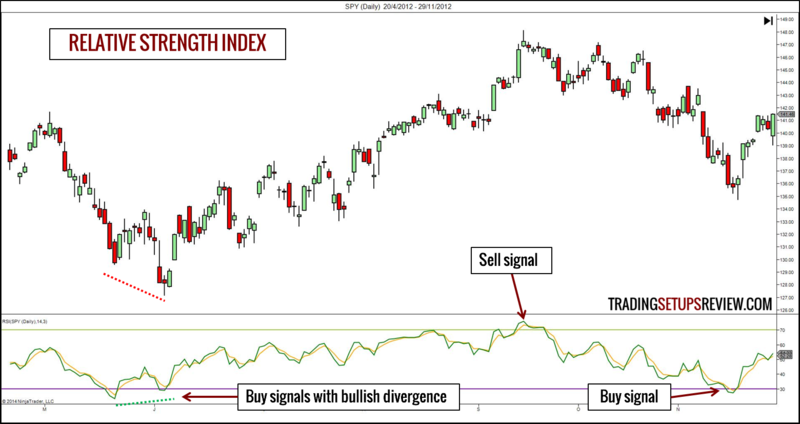 Combine candlestick patterns with RSI for a well-timed entry. Use RSI in day trading. Try an unusual RSI setting that works. Nothing beats learning RSI from Wilder himself. Donald Lambert’s CCI is another trader’s favourite. Although originally meant for trading commodities, it is also used for other financial instruments. 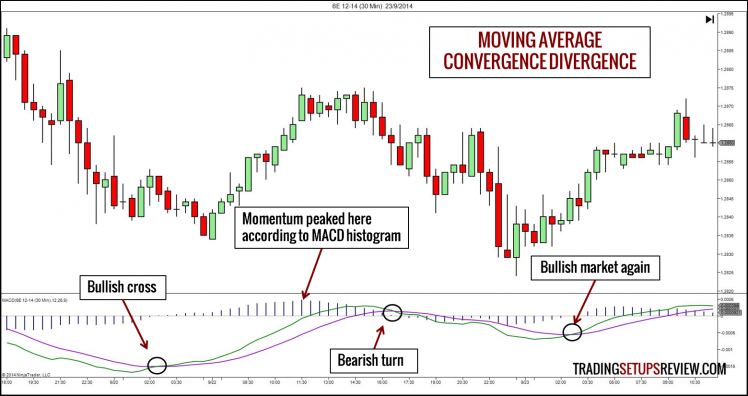 The CCI uses the deviation between price and its moving average to measure price momentum. It does so by comparing the deviation of the current period with the average deviation in the past N periods. Unlike the Stochastic and RSI, CCI values are unbounded. But, practically, due to a factor chosen by Donald Lambert, its value is usually between -100 to +100. Notably, the CCI uses typical price (H+L+C/3) instead of closing price. Its name is telling. The CCI works on the assumption that price is typically contained by an invisible channel around a moving average. If you think that the hidden channel will hold, you should follow these trading rules. If you think that the market will break out of the invisible channel, then look at Donald Lambert’s original rules. Day trade forex with Donald Lambert’s original concept. Woodie did a great job popularising the CCI indicator. The oscillators above work hard to find reversals. On the other hand, the technical indicators in this section try to pinpoint trends. Let’s welcome J. Welles Wilder again. He believed that to trade effectively, you must figure out if the market is trending or ranging. And the ADX is his tool for doing so. The ADX is built on the unique concept of directional movement. Positive directional movement (+DM) refers to the difference between the high of a price bar and that of its preceding bar. Negative directional movement (-DM) is the difference between the low of a price bar and that of the bar before it. Clearly, when the market is bullish, +DM is high. When the market is bearish, -DM is high. By combining +DM and -DM in a Wilder-ish formula, we get the ADX which is a measure of trend strength. 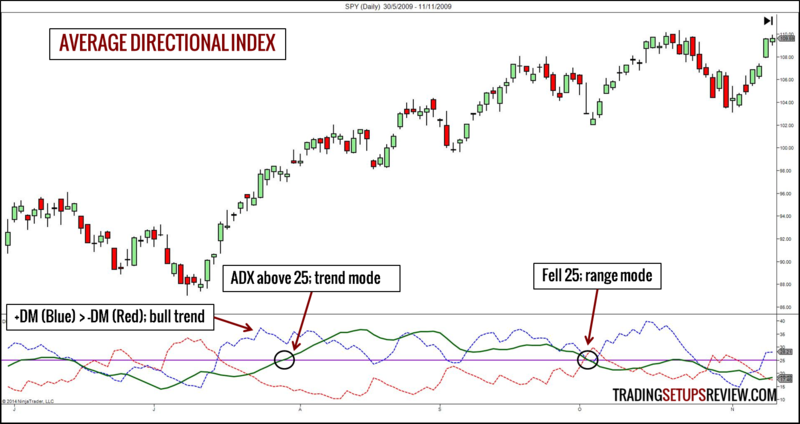 The ADX is a trend strength indicator. High values represent a trending market, and low values represent a dull one. Something is missing. Doesn’t the ADX show us market trend’s direction? Alone, it does not. But the ADX is often used with the +DM and -DM plots. For instance, when +DM is above -DM and ADX is above 25 like in the chart above, the market is in a bull trend. There is one more method to interpret the ADX. Time your trend trades with ADX(2). Again, Wilder’s book is the best resource for learning the ADX. But if you want a book wholly devoted to ADX, take a look at Charles Schaap’s book – ADXcellence. Gerald Appel’s MACD is one of the most intuitive technical indicators around. It amplifies the value of moving averages in an elegant way to track both trend and momentum. The MACD plots the difference between two moving averages, usually the 26-period and 12-period. A 9-period moving average of the MACD is then plotted as the signal line. If you see a histogram on a MACD plot, it is the difference between the MACD line and its signal line. The MACD works because, in a trending market, the space between two different moving averages expands. As the MACD always deduct the shorter moving average from the longer one, its value rises in a bull trend and falls in a bear trend. Also, the histogram highlights the momentum of the market. However, as the MACD is unbounded with no normal limits, it is not practical to define oversold and overbought regions. Hence, looking for MACD divergence is the preferred method. Combine MACD with the inside bar pattern to time your trades. Gerald Appel’s original MACD strategy from his book – Technical Analysis: Power Tools for Active Investors. An advanced MACD strategy with hidden divergence. 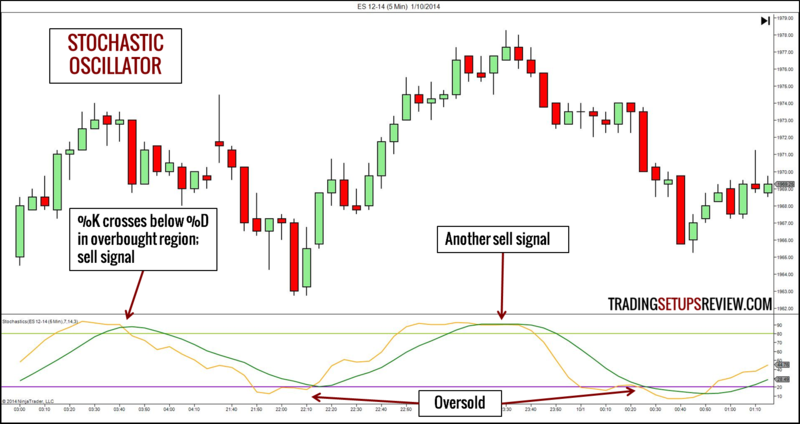 A 4-hour MACD strategy for forex trading. Price does not move in a straight line. It swings up and down. And the market often looks like it is moving within a price envelope. This is why many traders favour technical indicators that highlight the market’s channel-like movement. John Bollinger has given his name to one of the most popular technical indicators. 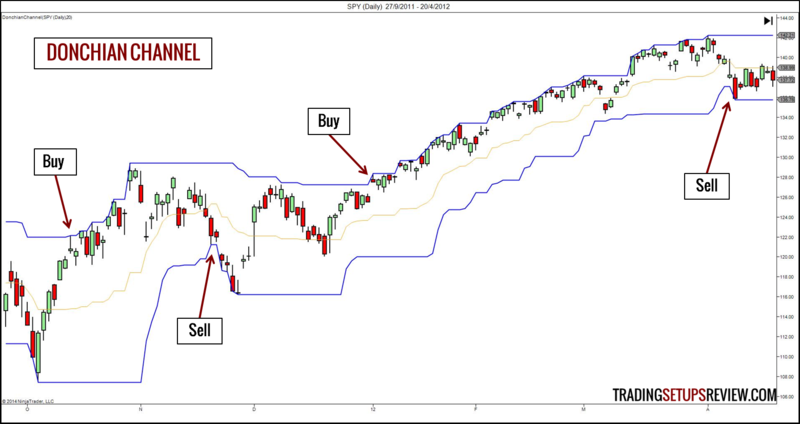 The Bollinger Band is now a standard overlay for many technical traders. The Bollinger Band might look erratic with its sudden expansions and constrictions. But it is, in fact, a straightforward and logical technical indicator. First, plot a moving average of the past N periods. Then, calculate the standard deviation of the past N periods. To get the upper band, displace the moving average upwards by a multiple of the standard deviation. For the lower band, displace the moving average lower by the same distance. The Gimmee Bar is an example of using the Bollinger Band in a sideways market. For example, consider this strategy which combines the MACD and the Bollinger Band. Trading the Squeeze with Bollinger Band. Read what John Bollinger has to say on Bollinger Bands. This indicator got its name from Richard Donchian, a pioneer of managed futures and the well-known Turtle trend-following method. There is no way we are giving this indicator a miss. The normal default period of 20 aims to contain four weeks of trading activity on the daily chart. The Donchian Channel plots the highest high in the last N periods as its top channel line. The lowest low in the last N periods is plotted as its bottom channel line. The Donchian Channel is designed to follow a trend. Each break-out of the channel is a possible start of a new trend. Try using the Donchian Channel in day trading. Curtis Faith describes a Donchian Channel trading system in his book – Way of the Turtle. The Keltner Channel as most traders know it now combines the ideas of Chester Keltner and Linda Bradford Raschke. The construction of the Keltner Channel is like that of the Bollinger Bands. However, instead of using standard deviation to draw the bands, it uses Wilder’s Average True Range. This difference causes the Keltner Channel to look smoother than the Bollinger Band. 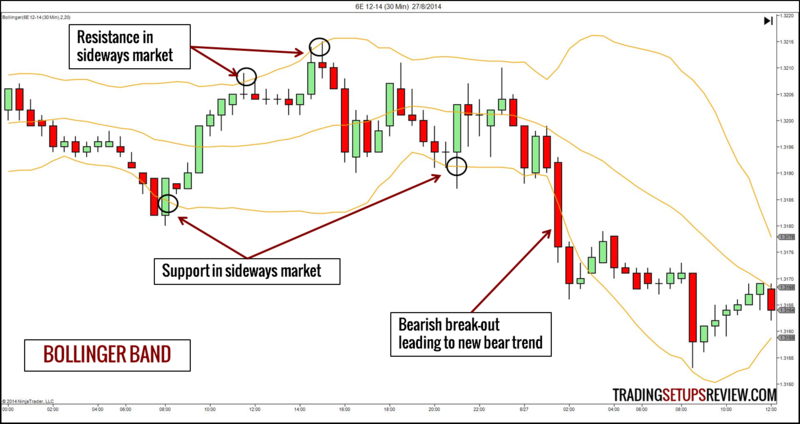 Find high-quality trend trades with the Keltner Channel. 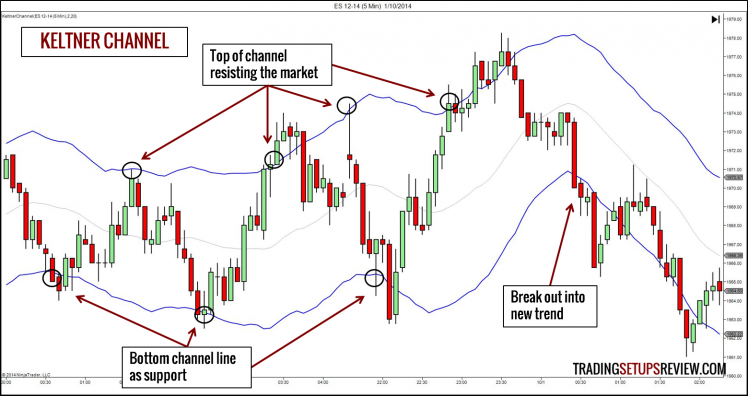 This article has a helpful comparison of the Keltner Channel and the Bollinger Band. Look at Chester Keltner’s original trading ideas. We have covered the basics of 10 essential technical indicators. But there is much more to learn before you can extract value from them. No trading indicator is perfect. The interpretation rules above look straightforward and mechanical. But they are merely guidelines. In fact, if you apply them mechanically, you will not make money. Grasp the market context in which they work. Learn to read price action together with technical indicators to complete your learning. Learn from the masters by following the links in the “Learn More” sections above. Combine indicators to form a rounded perspective. For a solid education on technical indicators, get this book – Technical Analysis: The Complete Resource for Financial Market Technicians (2nd Edition) . The behaviour of each technical indicator varies with its look-back period. The default settings might not always make sense. Experiment! The ten technical indicators we covered are derived from price. Volume is another important piece of market data. When you feel up to it, add in volume indicators for another dimension of analysis. Start with the OBV indicator. Find it tough to apply indicators? Try price action. 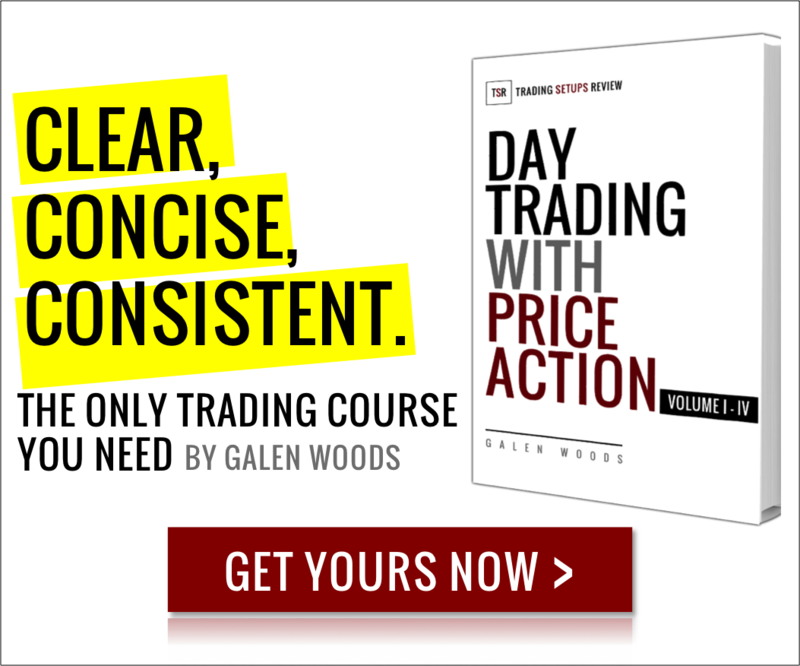 Click here for our ultimate price action trading guide.